The Compact PDF file format option could reduce the PDF file size by 50-70% percentage in some cases when converting Microsoft Word documents to PDF. The file size reduction is the most visible with one and two page documents. The Compact PDF file format is not recommended for NONE Latin character based languages such as Arabic and vertical text in the Far East languages such as Chinese … etc. Also Compact PDF file format is not recommended when the PDF document requires sophisticated and precise text layout rendering. 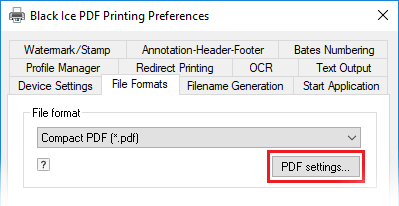 To navigate to the Compact PDF Settings go to the File Formats tab, choose the Compact PDF file format, and click PDF settings. For more information about Compact PDF options, please refer to our online manual.